“Who am I?” asks the woman whose head and ‘core’ were found on a trash heap under a city in the sky and stitched together with the cyborg body created for someone special by Dr Dyson Ido. 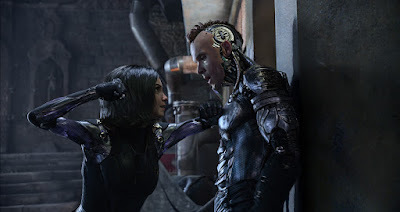 He breathes life into an amnesic woman who goes on to uncover the secrets of a cyberpunk world in which there could as easily be a bounty on your enhanced arm as your whole body. 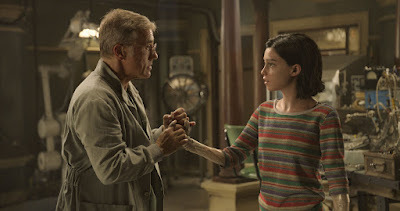 The motion capture and mix of live-action and CGI in Alita: Battle Angel is the most impressive thing about this movie. The titular kickass hero with distinctive eyes is played by Rosa Salazar, ably transforming her movement and mannerisms to switch from a 14-year-old to an 18-year-old half way through the film (although flashbacks hint that the character is much older than that). Expositional dialogue abounds to educate the audience about the constraints of this geographically-compact multi-cultural dystopian society. The ‘no gun’ rule certainly makes the weapons so much more interesting. The goodie/baddie flag for every single character – other than Ido’s surgical nurse, played by Idara Victor who regularly appears on screen but is strikingly given no dialogue – toggles throughout the two hours of action. 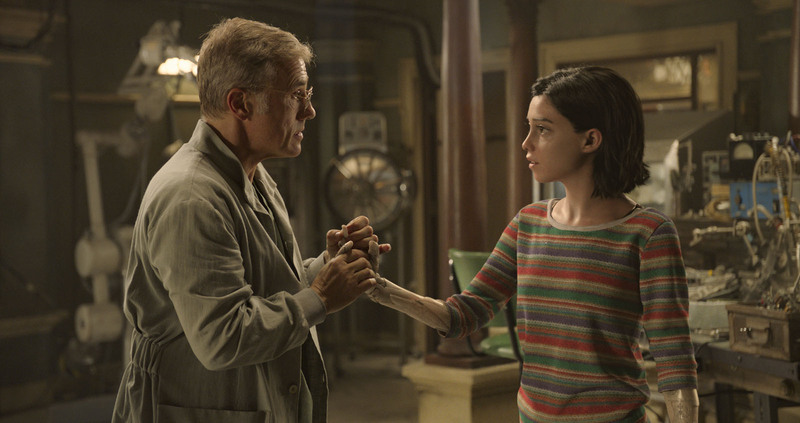 Clichés are embraced with abandon, with Alita even donning a long trenchcoat before entering a bar to deliver an impassioned speech that made the cinema audience audibly smirk as well as the hardened bounty hunters in the drinking den. There’s even a spot of kissing in the rain. 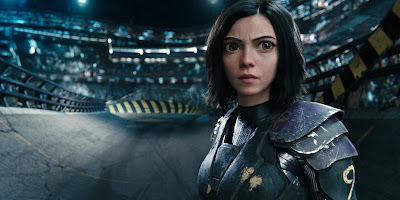 Alita: Battle Angel ticks James Cameron’s boxes for having a strong central female lead character and exploring how humanity adapts to technology. Making the next two parts of the threatened trilogy would be able to reuse much of the technical setup cost invested in this first episode. However, the epic ambition in Cameron’s mind was not delivered in the script he wrote and the film costing close to $200 million that Robert Rodriguez directed. 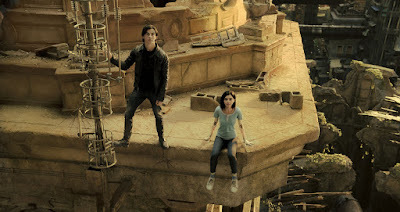 Released two days before The LEGO Movie 2: The Second Part, I fear that everything is not awesome and this fantasy dystopia is going to be buried under a pile of brightly-coloured bricks until it is resurrected for Alita: The Two Towers when the protagonist will ascend to Zalem in the sky, to battle the evil scientist in charge and avenge the death of someone else’s pet. 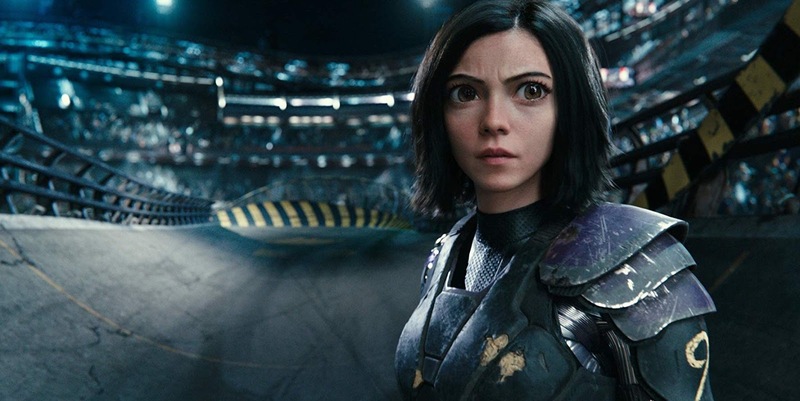 Alita: Battle Angel is released in local cinemas on 6 February.